Overview -- With a fresh look, revamped components, and class-leading performance, the 2017-edition KEF Q Series loudspeakers boast improved bass response and dynamic, transparent sound reproduction across all frequencies while costing the same as the previous generation. They're not as refined as KEF's R Series and speaker grilles are now a paid option, but my nitpicks are very small. Overall, the new Q Series is the best Q Series ever. If you're in the market for speakers in the next few years, demo these. There's a Q setup for almost every budget and room size. A best-seller since 1991, the KEF Q Series is a speaker line that, while not quite entry-level cheap, serves as a stepping stone to Hi-Fi goodness without paying Hi-Fi surcharges. I've personally owned or reviewed the last three Q generations, and when I speak of this series, I like to tell people about my wife, who is partially deaf in one ear. Ten years ago, she turned to me during an iQ9 demo (this is two Q generations ago) and said, "oh my God, it's like I can almost hear again." And now they're even better. The heart of every KEF speaker is what they call the "Uni-Q Driver Array." 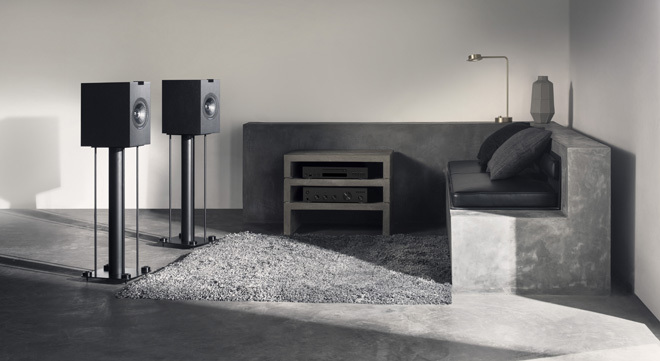 Rather than install a high-frequency tweeter and midrange driver in different locations, KEF places the tweeter at the acoustic center OF the midrange driver and bass cone. KEF says, "the result is a more detailed, accurate three-dimensional sound image, which is dispersed more evenly throughout the room than is possible with any conventional speaker." KEF also likes to round out its floorstanding speakers with one or more Auxiliary Bass Radiators (ABRs), which are passive bass drivers that feed off the towers' low-frequency driver(s). The 2017 KEF Q Series is the series' eighth incarnation, and it shows. My old iQs are fine, and the 2011 Q Series was quite good (review HERE), but the 2017s are almost as good as KEF's incredible and pricey R Series (review HERE). It's a demonstrable leap forward in sonics and performance, and sending these back to KEF will be a day of great sadness. Q950 Floorstanding Speaker ($899.99 each). The KEF Q Series flagship boasts one 8" (200mm) Uni-Q driver array, one 8" LF driver, and DUAL 8" Auxiliary Bass Radiators. With a frequency response range of 38Hz-28kHz, this 8Ω (3.2Ω minimum) speaker has a 113db maximum output, weights 45.4 lbs (20.6kg) and measures 41.81" tall by 9.6" wide by 12.91" deep plus a little extra when you bolt on the included plinths. Q750 Floorstanding Speaker ($749.99 each). The Q750 is set up much like the Q950, but with a smaller 6.5" (165mm) Uni-Q driver array, 6.5" LF driver, and dual 6.5" Auxiliary Bass Radiators. This 8Ω (3.2Ω minimum) speaker features a 42Hz-28kHz frequency response and maximum 111dB output, weighs 36.4 lbs (16.5kg), and measures 36.33" tall by 8.26" wide by 12.04" deep (plus a little extra if you bolt on the included plinths). Q550 Floorstanding Speaker ($549.99 each). Similarly, the Q550 boasts a similar configuration as its bigger brothers, but this time it's a 5.25" (130mm) Uni-Q driver array, 5.25" LF driver, and twin 5.25" Auxiliary Bass Radiators. Frequency response takes a hit on the low end, naturally, with a range of 45Hz-28kHz. But this 8Ω (3.2Ω minimum) speaker has a max output of 110db, weighs 32 lbs (14.5kg), and measures 34.37 inches" tall by 7.08" wide by 10.94" deep (plus a little extra if you bolt on the included plinths). Q650c Center Channel Speaker ($649.99 each). Similar to the Q750, the Q650c Center Channel boasts a 6.5" (165mm) Uni-Q driver array and 6.5" LF driver, but only one 6.5" Auxiliary Bass Radiator. With a 110 dB maximum output, this 8Ω speaker (4.2Ω minimum) weighs 30 lbs (13.6kg), features a 55Hz - 28kHz frequency response, and measures 8.26" tall by 24.76" wide by 11.96" deep (the height jumps up to 8.42" with the included rubber feet). Given its sizing, the Q650c pairs best with the Q950, Q750, and Q350. Q200c Center Channel Speaker ($499.99 each). If you can't splurge on the Q650c, KEF still sells the previous gen Q200c, which would be best paired with the Q550 or Q150, although it won't match visually. Perhaps we'll see a "Q250c" revision in the future. Regardless, the Q200c boasts a 5.25" (130mm) Uni-Q driver array and 5.25" LF driver, and one 5.25" Auxiliary Bass Radiator. With a 108 dB maximum output, this 8Ω speaker is limited to a 50Hz-40kHz frequency response range, weighs 24.3 lbs (11kg) and measures 7.1" tall by 20.7" wide by 10.2" deep. Q350 Bookshelf Speaker ($649.99/pair). The larger of the two bookshelf models, I like to imagine KEF chopping the top off a Q750 tower to produce the two-way bass reflex Q350. With a 6.5" (165mm) Uni-Q driver array for all frequencies plus a CFD rear port, the 8Ω (3.7Ω minimum) Q350 boasts a 42Hz-28kHz frequency response range and a 110dB maximum output. This bookshelf speaker weighs 16.8 lbs (7.6kg) and measures 14.25" tall by 8.26" wide by 12.04" deep (with the included rubber feet attached). Q150 Bookshelf Speaker ($549.99/pair). Like a Q550 tower without a dedicated LF driver or ABR, the Q150 features a 5.25" (130mm) Uni-Q driver array capable of a 47Hz-28kHz frequency response range and 108dB max output. This 8Ω (3.7Ω minimum) speaker weighs 12.3 lbs and measures 12.08" tall by 7.08" by wide by 10.94" deep (with the included rubber feet attached). Q50a Dolby Atmos-Enabled Surround Speaker ($499.99/pair). Much like the Q150, the Q50a Dolby Atmos modules feature a 5.25" (130mm) Uni-Q driver array, but with a smaller cabinet and no CFD rear port, you're limited to a 96Hz - 19.5kHz frequency response range and a max output of 106dB. Each 8Ω (4.6Ω minimum) speaker weighs 9.4 lbs (4.25kg) and measures 7" tall by 7.1" wide by 10.2" deep (with the included rubber feet attached). The 2017 KEF Q Series is available in two color schemes -- satin black or satin white -- which are smooth to the touch, yet look like they have a rough, grainy matte-finished texture. While previous generations featured chrome or grey Uni-Q drivers, the 2017 models have two different approaches -- the satin black speakers are monochrome with black drivers and ABRs while the satin white versions feature silver drivers and ABRs wrapped in black rubber. While my attractive review system arrived in all-black and will work with just about any decor, the satin white models seem a bit more high-end, and the color scheme makes the whole speaker pop a little more. Speaker grilles are a magnetic, optional accessory costing between $30/pair for the Q150s up to $45 each for the Q950s. I'm a little torn about this, to be honest; I only started using grilles after becoming a parent and appreciate KEF looking for ways to save the customer money... But if I just spent $1800 on new speakers for a pair of Q950s, the idea of having to drop another $90 on the grilles is less than thrilling. That said, I do prefer these speakers sans grilles. Setting up tower speakers can be a little intimidating the first time (or the tenth), so I always recommend having a second set of hands to prevent injury or accidents. KEF provides clear instructions on each (floorstanding speaker) box. For towers, flip the box upside down, open the bottom, attach the included plinths (spiked feat) if you are so inclined, slowly tip the box over and into the upright position, and lift the box up and off your speaker. Then you're ready to position and connect your wiring (FYI, if you're using banana plug connectors, you'll need to pop out the little red and black tabs in the center of the speaker terminals.). I recommend a good bit of toe-in, placing your towers as wide apart as you can fit and then angling them into your sweet spot. With the Uni-Q driver, this isn't critical, but for my two pennies, helps with front soundstage imaging. For anyone with children, plinths not only help with sound isolation but make the towers dramatically harder to knock over (my two-gen old iQ9s, which were never made with plinths and are more curved, are terrifyingly easy for crawling infants to tip over). Setting up the center channels and bookshelf models -- the Q650c, Q200c, Q350, & Q150 -- is even easier. Unpack the boxes, add the included rubber feet if you're so inclined, set them on a shelf or stand, and connect your wires. Much like the towers, you need to pop out the little red and black tabs if you're using banana plug type connectors. For anyone needing to wall-mount the bookshelves, the Q Series does not include any built-in brackets for these models. 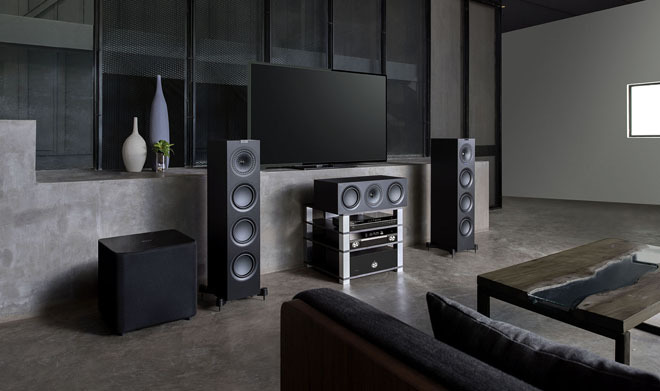 However, the Q50a Dolby Atmos-Enabled Surround Speakers do include a built-in bracket, so you can opt to set these atop speakers, or mount them to the wall. With your KEF Q Series in place, I recommend running room calibration software (usually included with most AV Receivers) and or manually calibrating your system by measuring speaker distances & levels, and setting your crossovers. For my review system, I set the Q950, Q350, and Q650c crossovers to 60Hz crossovers, the Q150s to 80Hz, and the Q50a speakers to 120Hz. Q950 Floorstanding Speaker. I adore the Q950 towers. They are, quite honestly, the best KEF Q Series speakers ever made, blending clear, transparent vocal tones and room-pressurizing bass. They destroy the capabilities of the old iQ9 towers and should receive an honorary membership to the KEF R Series because they sound a lot more expensive than $1,800/pair. For stereo music, they can pretty much do any genre, from hip-hop to rock n' roll to classical to electronic dance music. Toss in a single or dual-subwoofer setup, and the Q950s are almost unstoppable. I found a little bit of ear fatigue at extended reference level listening (and only at high volumes), but some or much of that could have been due to lower-quality audio bitrates found on many streaming services. Drop down to -5dB or -10dB with lossless or uncompressed or analog audio, and you can play the Q950 floorstanders for hours. Q650c Center Channel Speaker. 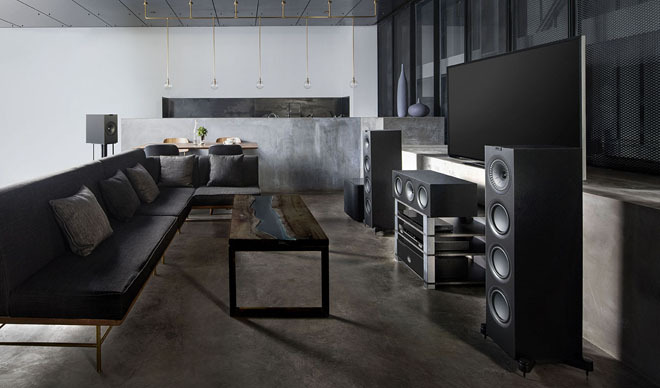 Towers get all the attention, and Dolby Atmos speakers make a system ultra-immersive, but a center channel is vital to a home cinema's overall performance. I wish the Q650c was a little shorter and a little wider, but the two 6.5" drivers and one 6.5" ABR deliver clear vocals and distinct imaging across the front soundstage. In swapping between the Q650c, old iQ6c, and a $200 center channel from another brand, returning to the Q650c is a delight thanks to its accuracy. You can even set them to "large" in your AVR's speaker settings with a 60Hz crossover and come away with no distortion. That's impressive. In an age where most people (understandably) go for a simple sound bar system, three cheers for a nice, beefy center channel that can keep up with its badass tower brothers. Q350 Bookshelf Speaker. The Q350s are as versatile as they are remarkable. As a side or rear surround, the Q350 speakers are authoritative, delivering deeper tones for aggressive sound effects and music (there's a reason Dolby adds full range speakers to its theatrical Atmos systems) so you don't need to rely on one or two subs. As stereo or front channel speakers, the Q350s sound like towers; they move a lot of air and are so transparent. Add in a subwoofer, and they're even better. If you don't have the room for towers or want to save money on a Q Series system, the Q350 might be the way to go. Q150 Bookshelf Speaker. Perfect for a 2.0 or 2.1 desktop setup OR as rear or side surrounds, the Q150 bookshelf speakers are the most affordable Q Series bookshelves, and they do a respectable job with mid-to-high range vocals, music, and sound effects. However, you definitely need a subwoofer to fill in the missing sonics. Q50a Dolby Atmos-Enabled Surround Speaker. Here's the truth about Dolby Atmos branded/capable speakers: the overhead immersion is not only convincing, but we're also finding that they work well in imperfect environments (high or angled ceilings, etc.). Yes, bouncing sound off a ceiling isn't as precise as having in-ceiling speakers, but KEF's got you covered there too. The Q50a speakers include a built-in bracket for wall mounting, so you can hang these high on a wall for use as true Atmos overhead speakers. And they sound very good. Yes, they don't have the LF performance of the Q350 or Q150 bookshelf speakers, but with your AVR handling the crossovers and sending the LFE to your sub, you won't notice. Do me a favor and take out your favorite demo disc. Something with thundering bass, screaming sound effects, and aggressive surround panning that doesn't overdo it. We don't want chaos and noise... we want delicate, balanced, and orchestrated chaos where you can hear every fine detail in the aural madness. Maybe it's The Fifth Element, with its room-shaking bass. Maybe you reach for Mad Max Fury Road for its haunting overhead voices and roaring guzzoline engines. Maybe you lean back into your seat as Gravity hurtles you through space. Or maybe you fly through the rainy hellscapes of Blade Runner 2049 while Hans Zimmer and Benjamin Wallfisch's orchestral maelstrom surrounds and envelopes. We all have our favorite demos. And the more we know them, the more we know when they sound right. Lesser speakers tend to condense and fatigue while refined speakers reveal and evoke. For my money, a KEF Q Series system delivers the goods in all the right ways. Sound effects and music immerse and race around the room. Dialog and vocal tracks are crisp and clear. Low frequencies, midrange, high, it's all there in a way that makes the speakers disappear. All I can hear is the world the filmmakers are creating for us. It's beautiful. Thanks to my trip to CES and a hectic few weeks with reviews, I've listened to at least three dozen different speakers and soundbars in the last two months, and the KEF Q Series stands tall next to some expensive competitors at all the but the loudest volumes. That's the difference between the KEF Q Series and R Series; where the R Series gets better and better up to reference-level volumes, you can strain the Q Series with a little too much bass and a little too much volume (Blade Runner 2049 in Dolby Atmos is no joke!). Still, I don't usually listen to speakers at reference volume. -10dB to -25db is my go-to range, personally, and here, especially when you compare the Q Series to cheaper speakers or every sound bar ever, it's no contest. At sub-ear-bleeding volumes, the Q Series might as well be called the Baby-R Series. It's that good! The KEF Q Series has come a long way in its last eight generations, topping itself with each innovation and iteration. Much of this evolution comes courtesy of KEF's habit of developing high-end features for gear that costs more than most supercars and then stuffing it into speakers that MSRP anywhere from a few hundred to a few thousand dollars. For my non-engineer self, I'll call this magic sauce. And, friends, the 2017 KEF Q Series is oozing magic sauce. Astonishingly good... reasonably priced... the best Q Series ever... If they're in your budget, time to get your demo on. Highly Recommended all around. 2 Q150 Bookshelf Speakers (rear surround - $549.99/pair).